A cellar may conjure something dark and musty; fortunately, neither describes the Mona Lisa Wine Cellar. This offspring of The Mona Lisa Fondue Restaurant in the space above features an extensive wine list along with cheese and chocolate fondue. The super-friendly one-person staff oversees the 10 or 12 tables. Even though the menu is limited, diners still have decisions to make. For example, it’s not just cheese fondue. It’s possibly Old World, New World, South of the Border, Creamy Fontina, Greek Isle, or Brie. We opted for two fondue pots: Old World and Brie. These not only complemented one another, but also were the right amount for our group of four. The Old World is a blend of Emmental and Gruyere cheeses in a white wine base; the Brie, too, was in a white wine base and accented with almonds slivers. Both were gooey with nutty undertones; the Brie was slightly creamier. Bite-size pieces of bread, fresh fruit and raw vegies are served for dipping. 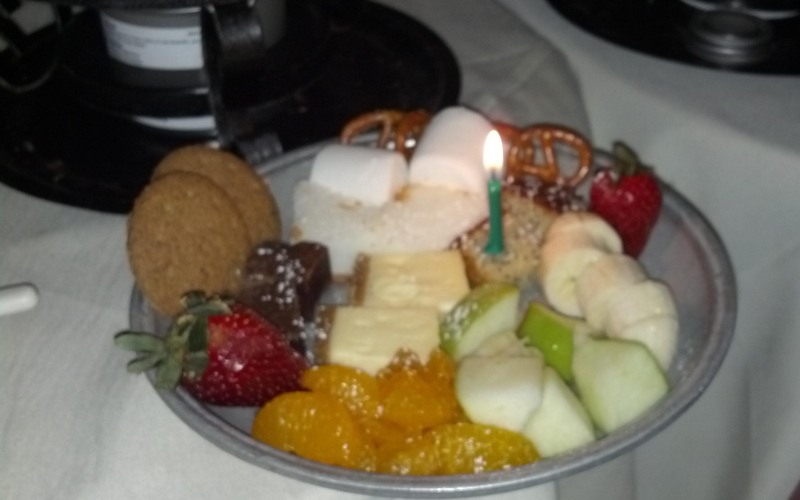 Even if one of my friends was not celebrating a birthday, we were primed for chocolate fondue. Again, a number of choices are available including dark, milk and white. Further flavor profiles are created with the addition of liqueurs. We chose dark chocolate and chocolate with raspberry. Fresh fruit, cookies, marshmallows, pound cake, Angel food cake and brownies are served for dipping. The beauty of fondue is that it’s communal and requires a slow pace. Add a bottle of wine and the meal is rich in taste and camaraderie. Spice of Life is always one of those reliable go-to places. Well, almost always. Breakfast and lunch standards have been part of the Spice landscape for (20) years. In truth, the food is more than standard, especially considering the small cooking/prep area behind the counter. This is a popular Manitou Springs hangout. It’s the spot to meet friends, have a cup of coffee or pick up a gourmet food item, including spices. Recently, a beer and wine license was acquired and tapas appeared on the menu. Unfortunately, the tapas fall into the average category. By definition, tapas are small plates. Although they’ve been around for years, it seems there’s a tapas bandwagon that has recently come into favor in the Colorado Springs area. Without taking anything away from the Spice guys (Michael and Doug) or their establishment, snacks are a more honest description for much of the Tapas menu. Handfuls of olives, cheese, slices of baguette and roasted peppers fall short of a well-rounded tapas identity. Of course, if we had ordered the Caprese Sandwich or Chicken Skewers, something that involved cooking or more preparation, I’d have less to quibble about. Nonetheless, the appetizers were tasty: a large variety of olives, a tangy caponatta, and a creamy Roule – in this case made with sheep’s milk and rolled in herbs. I’ve always been pleased with the granola pancakes and sandwichs (especially the Vegetarian Delight), I’ll stick to those. Although, when enjoying a glass of wine, it is nice to have a little nosh.